The following pages are my place for sharing my thoughts related to the science and art of palaeontology. Feel free to contact me via email at dariusnau@gmx.at. This site is a work in progress, and any questions or suggestions are appreciated. 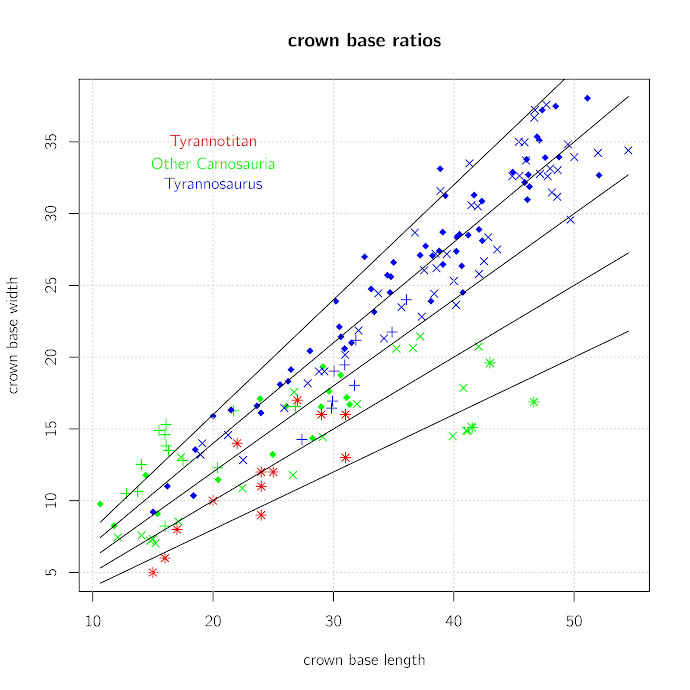 Are the teeth of Tyrannotitan less blade-like than other carnosaurs’? Frankly, I have got no idea where this myth originally came from, but being called Tyrannotitan does not imply being in any way more similar to Tyrannosaurus than its relatives were. T. rex does not have a monopoly on that part of its name, on the other hand it seems to have one on its blunt, incrassate teeth. Canale, Juan I.; Novas, Fernando E.; Pol, Diego (2015): Osteology and phylogenetic relationships of Tyrannotitan chubutensis Novas, de Valais, Vickers-Rich and Rich, 2005 (Theropoda: Carcharodontosauridae) from the Lower Cretaceous of Patagonia, Argentina. Historical Biology: An International Journal of Paleobiology, 27 (1), pp. 1-32. Royo-Torres, R.; Cobos A.; Alcalá, L. (2009): Diente de un gran dinosaurio terópodo (Allosauroidea) de la Formación Villar del Arzobispo (Titónico-Berriasiense) de Riodeva (España). Estudios Geológicos, 65 (1), pp. 91-99. Smith, Joshua B.; Vann, David R.; Dodson, Peter (2005): Dental Morphology and Variation in Theropod Dinosaurs: Implications for the Taxonomic Identification of Isolated Teeth. The Anatomical Record, 285 (A), pp. 699-736.